ESIM does not just sell software. It also provides consultancy services on using information and performing data access. It is therefore e reliable guide in th establishment of Hospital Information System workflow and business organizations within the hospital. Our Consultants Expert Team exists from professionals who has gained high level of expertise in Managing the HIS in the hospitals. They know how to Manage a hospital and make the investment profitable for the investors. We are specially focused in big scale HIMS projects to offer our HIMS Software Solution with Excellent Management support by means of our experienced Consultants. With its experienced Computer and Software Engineers and System Support Team specialised in hospitals IT departments, ESIM Software is able to provide a high quality of service, meeting the rigorous standards necessary for the ISO9001/2008 certificate. It supports its products and services with a competent staff that is acknowledged and supported by the latest technology. Our staff continuously attend Microsoft Software training sessions. It consantly monitors the performance of these staff through procedures suggested by the ISO9001/2008 Total Quality Management and customer satisfaction surveys, eliminating any problems as they arise. 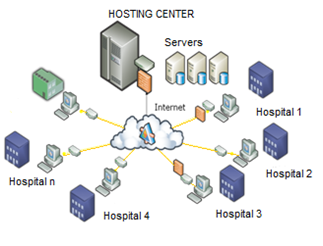 Cloud services helps healthcare organizations manage their complex healthcare IT solutions infrastructure while freeing up physical space, resources and costs associated with maintaining computer servers and deploying client-based applications on-site. With Cloud Based Platform organizations can ensure they are always operating with the most current technology for their information systems. Software installation, upgrades and patches and network configuration and repairs are handled by Cloud Data Center IT experts behind the scenes, so hospital IT departments can focus on more strategic initiatives. We can offer Cloud HIS services as SaaS,IaaS on Any Cloud Platform which is scalable when the demand is growing. ESİM Software has gained a Software Projects Export experience in different countries and is able to Consult the companies with gained market know-how who want to enter CIS and EMEA Region Markets. - Needs assesment: Each company is interviewed to determine their product sector orientation, core capabilities and internal targets. Following the interviews, each company is assessed and company specific actions are tailored. Consolidation of company-specific actions revelas the sector’s need analysis. - Target Market selection and assessment: In alignment with the global outlook and company capabilities targets market will be selected. - Global and Turkish Marketplace assessment: Both the global and Turkish IT Software Customers are assessed to provide the big picture of the industry. Corporate strategies will be developed , operating models and business models are determined to provide the strategic framework for company assessment. - Benchmark company assessment. Target market countries are selected ana assessedbased on key success factors. In order to do so, it is apparent that both company-specific and sector- specific actions should immediately take place within the domain of corporate strategy, go-to market strategy, organization, sales push and sales capabilities an incentives. - Go-to-market: Exports oriented requirements in terms of main components of the business model shaping the go-to-market strategy approach. - Organizational: Specific actions necesaasy for internal restructuring of the company, mainly focusing on initiating or enhancing a dedicated marketing sales structure. - Sales capabilities abd sales push: The necessary actions in coordination with external parties to foster sales. - Trainings, certifications and incentives: Support initiatives required by companies to increase their credibility in the export markets and ease the financial requirements.